Digitize, automate, and accelerate customer and back-end processes with market-leading software. Automate on-boarding, loans and mortgages, servicing, and operations with banking solutions from Kofax. Automate on-boarding, claims processing, servicing, and operations with insurance solutions from Kofax. 76% of logistics providers have not automated key customer-facing processes like scheduling shipments, monitoring changes, and updating customer statuses. "There are a number of other benefits to using Kofex, such as continuity," noted Geurts. "Our goal to process each incoming piece of mail within eight hours and losing some full-time employees early on endangered our ability to deliver on that. The new Kofax solution implemented by Docspro helped us achieve the goal with no problems. Another advantage is the reduced rate of misplaced documents. With Kofax as our document, correct and timely archiving is now more assured." "Kofax plc (LSE:KFX) is leading provider of innovative smart capture and process automation software and solutions for the business critical First Mile of customer interactions. Theses begin with an organization's system of engagement, which generate real time, information intensive communications from customers, and provide an essential connection to their systems of record, which are typically large scale, rigid enterprise applications and repositories not easily adapted to more contemporary technology. Success in the Fist Mile can dramatically improve an organization's customer experience and greatly reduce operating costs, thus driving increased competitiveness, growth, and profitability. Kofax software are solutions provide a rapid return on investment to more than 20,000 customers in baking, insurance, government, healthcare, business process outsourcing and other markets. 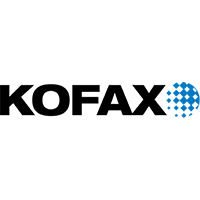 Kofax delivers these through its own sales and service organization, and a global network of more than 800 authorized partners in more than 75 countries throughout the Americas, EMEA and Asia Pacific." "A Kofax customer for Kofax for nearly 15 years, Swiss Post decided on a central installation of Kofax Communication Server enables the automate exchange off business critical information, liking both inbound and outbound services provided by devices such as fax and phone systems, edia types that include email, FolP, SMS, MMS, voice mail and telex, applications such as ERP CRM and Kofax enterprise applications, and social collaboration tools. The system was intended to take over the coordination and automatic exchange of information for the entire group."